Over ripe bananas are only good for one thing…Banana Bread! I had a few bananas that were past the point of being edible on their own so off I went baking, but I wanted a little more than just banana bread. 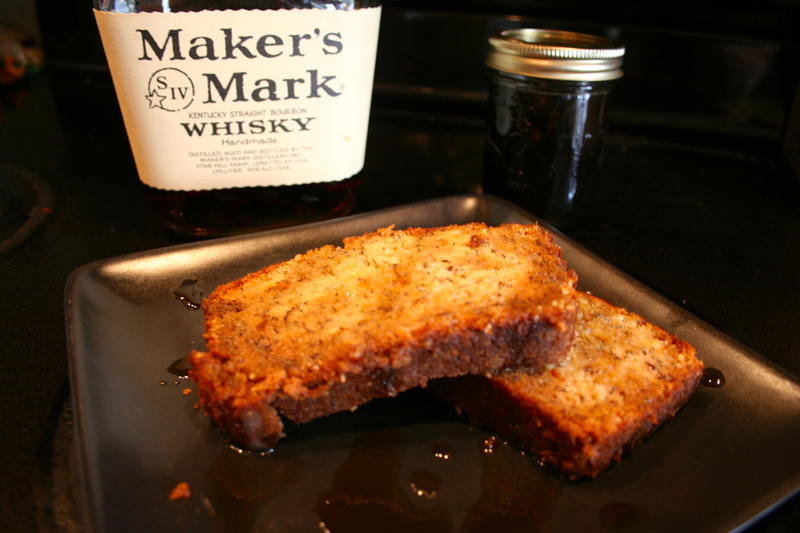 I wanted something to top my banana bread…BOURBON!!! Hey, bourbon is good on just about anything and in Kentucky we can think of some pretty creative ways to use it! Preheat oven to 350 degrees. Butter and flour 9x5x3 inch loaf pan. In a large bowl, whisk together flour, baking soda, baking powder & salt. In a separate bowl, mash the bananas with a wooden spoon (leave some small chunks). In another large bowl, use a mixer to cream the butter & sugar together until fluffy. Add eggs one at a time. Stir in the bananas, sour cream, vanilla and beat until combined (you can add in nuts or chocolate chips at this point if you want). Stir in the dry ingredients and pour batter in loaf pan. Place pan on a baking sheet on middle rack of oven. Bake for 1 hr & 10 min. Cool 5 min in the pan then turn out onto wire rack to cool completely. 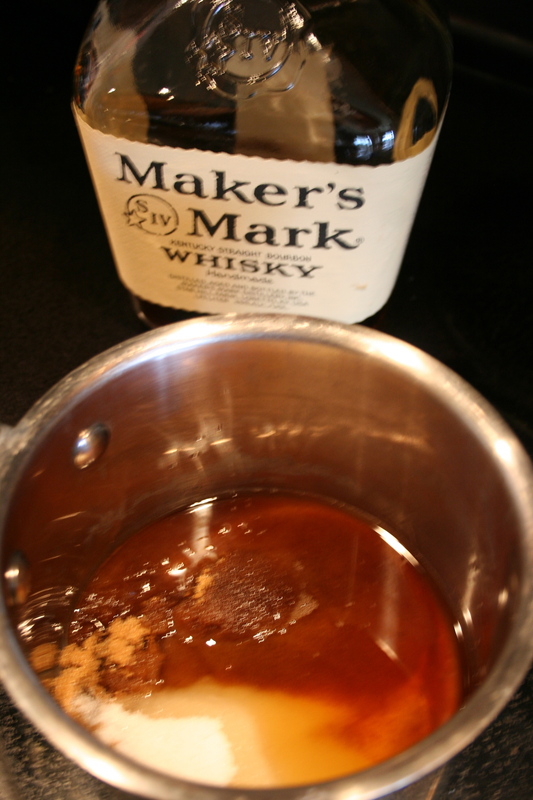 Bring brown sugar, white sugar, bourbon & water to a boil over high heat. Turn heat to medium-low and continue to reduce until it is syrupy (about 6 min or so). Stir it occasionally to prevent it from burning. Cool for 5 minutes and serve over banana bread. The bourbon sauce can be stored in the refrigerator. Just warm it up and stir before serving. I have no idea how long it will keep because it really doesn’t last that long around here. Want to know an easy way for the family to get in all of their daily servings of veggies? Just bake this delicious Carrot Cake from Gimme Some Oven! Super Easy Valentines Day Square Treats!